Getting around Rio is easy: just get in a cab! 1 out of every 3 cars is a taxi (or so it seems). What’s more: it’s cheap. 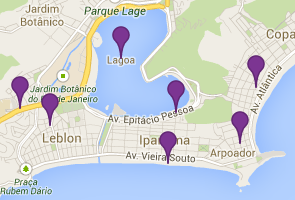 You can go from downtown to Ipanema for about R$40 (US$11). From Ipanema to Barra for about the same. The meters have 2 rates (bandeiras): “1” for daytime (6am to 9pm) and “2” for nighttime, weekends, holidays and the month of December. The “2” bandeira charges 20% more than the “1”, so check. Just remember to ask the taxi driver if he knows how to get to where you want to go before you step in “voce sabe chegar no …. “ pronounced “vo-say sa-bee shay-gar no [insert place here]…”. If he doesn’t know, hand him your hotel card or take the next cab. You can also request a cab pickup using the 99 Taxi app, available in English, and you can also pay with paypal or credit card, just as easily as the Uber process. Very efficient, not too packed, cheap and fast! Check the Rio Big Map attached to the back of this book. The other, less recommended, transportation method are the public buses. Although a lot cheaper, these take longer (up to 55 minutes from downtown to Ipanema, where a cab would take 20 minutes). Enter thru the front, pay inside for each route. There are no day-passes. A safe and comfortable option if you are going between Barra, Leblon, Ipanema, Copa and centro is to take the “Frescão”, an air conditioned passenger bus that serves the business commuters. They go for R$14 and run more frequently during rush hours. Uber drivers are everywhere, offering their “better than cabs” service. Use the Uber English option for English speaking drivers. If you plan your activies nearby, you can use a bike for at least half of your stay in Rio, as most attractions are under 1 hour away from Copa/Ipanema.